Today was the day, 186 years ago that the Nephite record known as The Book of Mormon passed from immortal to mortal hands. Interestingly enough, that night as these events unfolded to the knowledge of a few, the Jews blew their shofar trumpets celebrating Rosh Hashanah (the Feast of the Trumpets) on the other side of the world. What significance did this high holy day have to coming forth of the Book of Mormon? Read, Joseph Smith’s Receipt of the Plates and the Israelite Feast of Trumpets, and you’ll never see this event the same way again. In 34 A.D. Jesus Christ taught a remnant of Jacob living upon the American continent “Behold, I say unto you that the law is fulfilled that was given unto Moses” (3 Ne. 15:4) but adds that “the covenant which I have made with my people is not all fulfilled” (3 Ne. 15:8). 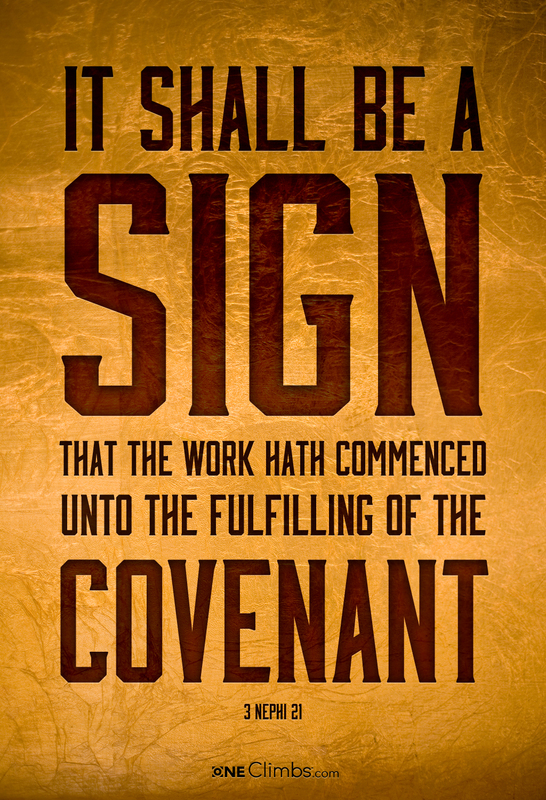 Jesus then gave a sign to know when this covenant was going to be fulfilled. One of the most important reasons that we build temples is so that the Abrahamic covenant can be fulfilled, and that through the atonement, the original blessings promised may now be extended back throughout time to all mankind from here in the last days. The restoration began with the sign and the message, the temples, and the gospel are the work and when Christ comes again, it will be to initiate a millennium of peace wherein the covenant can be completely fulfilled to all of Abraham’s seed and all of God’s children. It is fitting then that Moroni, with trumpet in hand who took part in the sign that the work of the Lord has commenced, stands atop many of the very places where the covenant is being fulfilled – the temples. My feeble attempt to do this subject justice was a four part series I published back in 2010. Do you do anything special on this day? What does the fulfilling of the covenant mean to you? How do you look at the Moroni statues on the temples in light of this information? I’m not getting your link to “Joseph Smith’s Receipt of the Plates and the Israelite Feast of the Trumpets” to work. Can it be fixed? Ok, I updated the link. Looks like the Maxwell Institute updated its website and destroyed all the original permalinks (boo). The new site seems much nicer though and much more pleasant to read. The calendar of events given to Moses was to be a “Perpetual” calendar for all time. So it’s not surprising that the Lord would provide the Plates on a Day given to us as a Sign of God’s Plan to begin the gathering of Israel in the Last Days. Just as Passover was given to the people of the Lord’s day as a Sign of the Lord’s Birth, and coming to the earth to perform the Great Sacrifice symbolized by the Sacrifice of the Unblemished Lamb. It would certainly make a lot of sense for those events to coincide with those dates. Whether it is this year or not, well, we’ll see. It will happen at some point and I don’t think there is anything wrong with following the patterns established in the past. One more observation pertaining to how the Feast of Trumpets is laid out upon the Hebrew calendar. The Jews celebrate certain events such as the feast of Trumpets on TWO days rather than one. The first day of celebration comes to those Jews living in the State of Israel, while the second day of observation is practiced by those who live in the DIASPORA (the DISPERSED Jews throughout the world). On the Jewish Calendar of the year 1827, you can plainly see Sept 22ond is the FIRST Day in which the Jews would have celebrated that Feast. The day that Moroni handed over the Plates to Joseph to BEGIN the Gathering of Israel. The next day of Sept. 23rd on that same year, you can see where this is the SECOND day of celebrating for those in the Diaspora. Maybe FORECASTING a date in the future when the gathering would be COMPETED by the coming forth of New Records. The Diaspora Representing those members who are presently Dispersed from among the main body of the church for having contrary beliefs concerning “Some Things” the main body holds to be true. Could the Lord be telling us that the FULL Restoration of the gathering of Israel and the FULL implementation of the Gospel would be introduced on the 23rd of Sept of some future year (2017 Jubilee Year), when the Lord “Sets His hand again for thee SECOND time”, following the FIRST time He set His hand on Sept. 22ond 1827 , as pertaining to what is described in the Book of Isaiah concerning the Lord setting His hand TWICE to establish the FULL Gathering of Israel to Zion ? Great stuff, Rob, thanks for sharing, I wasn’t aware of the two day celebration, that adds much to think about. I don’t know that it would be on the 23rd of September, that date specifically, because the Hebrews use a different calendar. To your point though, you’d be looking for the second day of the feast regardless of where that falls on the Gregorian calendar.